NEW BMW 4 SERIES CONVERTIBLE. Catch the sun, feel the wind and savour every driving moment. With sporty agility and stirring dynamics, accompanied by an impressive, aerodynamic design and stylish equipment with innovative functionality, the new BMW 4 Series Convertible is the most contemporary interpretation of driving. 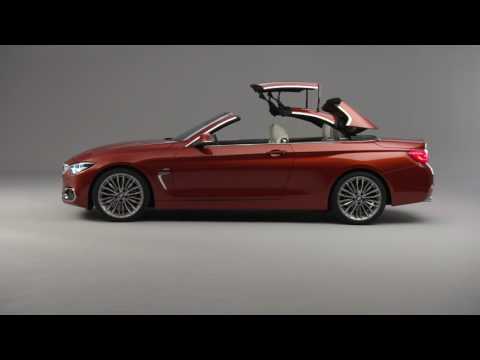 THE BMW 4 SERIES CONVERTIBLE IN MORE DETAIL. The multi-faceted design of the BMW 4 Series Convertible makes it an imposing sight even when stationary. The unmistakable design of the new BMW 4 Series Convertible conveys a sense of elegant athleticism, thanks to its distinctive front end, extended bonnet and wedge-shaped silhouette. Inside, choice materials, leather upholstery and ambient lighting create a lounge-like atmosphere when the roof is closed. Whether the roof is open or closed, the design of the new BMW 4 Series Convertible is captivating. Thanks to a unique blend of sporty aesthetics, exceptional styling and powerful dynamics, every drive is a confident statement. Take the wheel of the outstanding BMW 4 Series Convertible and experience it for yourself. With over 100-years of refining, every BMW model has been crafted to deliver pure driving pleasure. There has never been a more exciting time to drive the open road. Fuel economy figures for the BMW 4 Series Convertible range: Extra Urban 45.6 – 65.7 mpg Urban 24.8 – 49.6 mpg Combined 34.9 – 58.9 mpg CO2 emissions 195 - 127 g/km. Figures may vary depending on driving style and conditions. Test drive subject to applicant status and availability.